'Lots of dead', 'water full of snakes': cyclone survivors recount - SABC News - Breaking news, special reports, world, business, sport coverage of all South African current events. Africa's news leader. 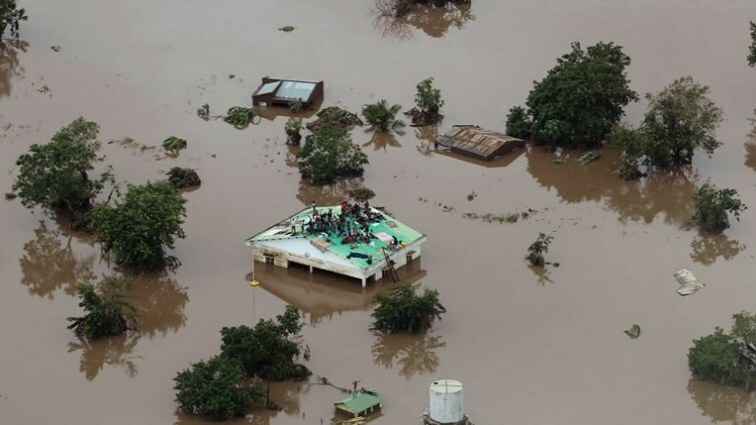 The Mission Aviation Fellowship picture shows people on a roof surrounded by flooding in an area affected by Cyclone Idai in Beira. “It was very scary, we were running in all direction, the water was full of snakes,” recalls 39-year-old Otelea Jose after arriving from one of the areas worst hit by southern Africa’s deadly cyclone. She survived by scaling onto the roof of a local administrator’s office, but 446 other of her compatriots were not so lucky. There are “lots of dead (people), we can’t even count”, he says. “There was a man, he had 40 cows and he lost all of them. Forty! Imagine. Everybody lost everything,”he says. “I have never seen anything like that, even the elders have never experienced something like that, it’s new. ” In 2000 there was flooding but (the water) was up to the shoulder-level only. “But this time …the water covered everything,” he says. But as a rainbow appears in the sky, more people start to venture outside into the wet and muddy streets of Buzi — 30 kilometres southwest of Beira — to try pick up pieces of their lives. This entry was posted on 25 Mar 2019,03:50PM at 3:50 PM and is filed under Africa, News, Homepage Latest Stories Slider. You can follow any responses to this entry through the RSS 2.0 feed. Both comments and pings are currently closed.